In America I think nearly every kid had a blanket they loved and cherished. I still have one! On a recent trip my friend Omar Garcia gave a couple of kids their first security blanket, a hand made quilt from Texas! Every stitch was made with love; and the kids can feel it. Below is Samnang. His mother is a slave and he and his brother were brought to us because the mother knew they would not have a future around her. It is likely his mother will never come back. A boy like this, only 4, needs all the love he can get. 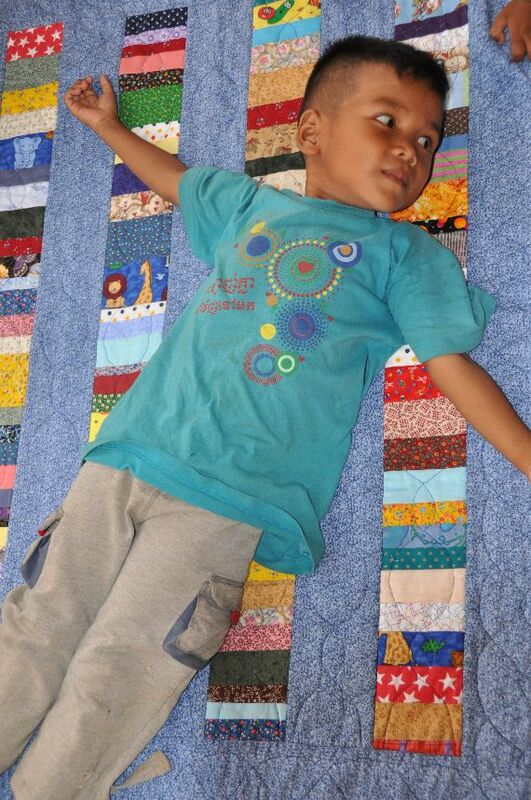 Another boy who got a new quilt is Malachi. Malachi has some learning disabilities and deep insecurities. When he got his blanket, he smiled. This was not a small achievement. Malachi loves his quilt! It is wonderful for these two boys to be the recipients of love from women who they have never met. It is a huge blessing for me to see women using their gifts to bless others. Many times people ask me what they can do to help; many assume I am looking for theologians. No, we only need people to use the gifts God gave them for his glory. Thank you so much Kings Quilters! God bless you all! May God give you strong hands to make hundreds more quilts for babies and children around the world! Kings Quilters is a ministry of the women of Kingsland Baptist Church in Katy, Texas.